Utilising innovative design and manufacturing the pTrumpet is made entirely from plastic. As a result pTrumpet is very light weight, has remarkable sound quality, terrific playability and looks really cool and funky. 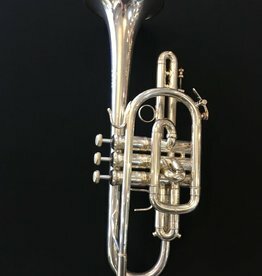 Bach Stradivarius model 184G Large bore cornet in silver plate. 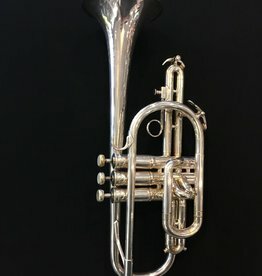 It's a recently made British style cornet from Bach that is in great condition with case, but no mouthpiece. Great player at a fantastic price. Horn has compression in all valves and the plating is in great condition with the exception of a blemish on the bell. 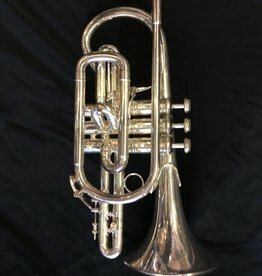 Excellent condition second hand Bach cornet. Plays well and valves move beautifully.